This bride and groom tied the knot 13,000 feet above the Tooele Valley and capped off their high-flying Utah wedding by jumping out of the airplane and floating gently to earth. The groom considered the implications of the jump for his brand-new marriage. “I guess it leaves a lot of high expectations to live up to,” Allan Wood said. 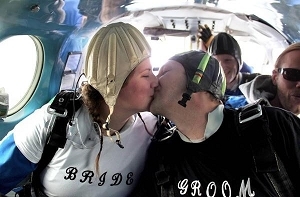 Neither of the newlyweds are veteran skydivers. It was the bride’s third jump and the groom’s second. As novices, they weren’t allowed to jump together. Each was partnered with a veteran tandem skydiver. In all, 12 people bailed out of the Beechcraft King Air shortly after the ceremony. The bride, the groom, the preacher and two witnesses jumped, each with a tandem partner. Two experienced skydiving photographers also jumped to capture some very unusual wedding pictures. Emily Lucero Wood acknowledged that some friends and relatives thought they were crazy to literally “take the plunge” on their wedding day. I think some of the family was a little bit shocked when they heard that we were doing so,” she said. Just before going airborne for the ceremony, Allan Wood admitted to being a bit nervous. As it turned out, the groom and his tandem partner made a soft landing right on target at the Tooele Valley Airport. His bride landed safely a couple of hundred yards away. She quickly ran and jumped into her new husband’s arms and gave him a big kiss. They said they’ve discussed the idea of jumping again on a future wedding anniversary, possibly with some relatives. What do you think? Would you do this for your wedding? ?